William & Mary geologists Lauren Visokay ’18, Moussa Dia ’18, and Cece Hurtado ’17 enjoying the beach at Qantab, Oman. 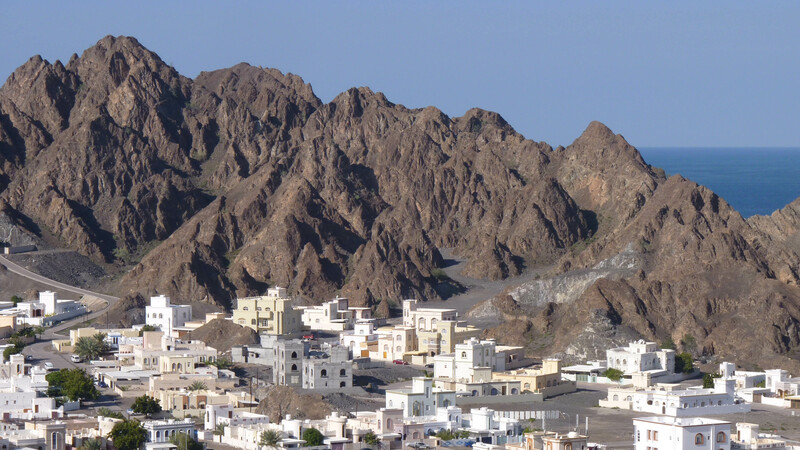 Qantab is a village at the eastern edge of the Muscat metropolitan area, it’s hemmed in by steep rocky hills, and flanked by a broad strand that faces out to the Gulf of Oman. 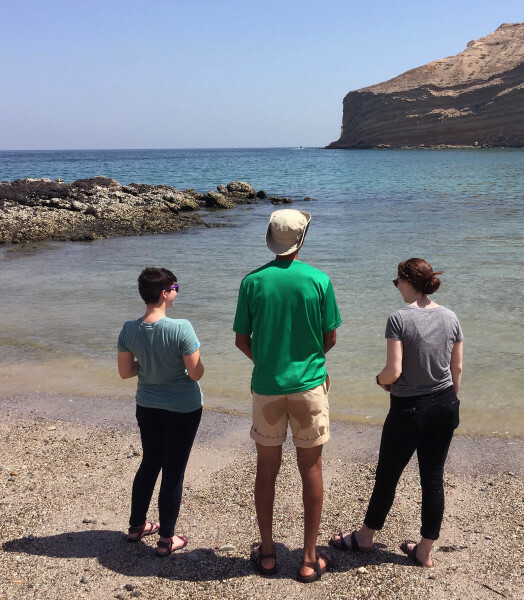 It is one of my favorite spots in Oman, and I recently visited Qantab with my research students on a Spring Break trip to study the Semail ophiolite. After nearly a week of field work in the mountains, our plan for Qantab involved relaxing on the beach and playing in the surf. However, in Oman, geology is all around and even while bobbing in the surf it is hard not to appreciate the spectacular scenery onshore. The village of Qantab, Oman with the waters of the Gulf of Oman visible in the distance. The craggy and steep hills are underlain by Cretaceous ophiolite. Just up the road, about a kilometer from Qantab’s beach is a geological triple point; it’s a spot where three of Oman’s major geologic units meet. But just what is a geological triple point? Simplified bedrock geologic map of the area near Qantab, Oman illustrating a geological triple point. Image base from Google Earth, geology based on field observations and modified from Le Metour et al. (1986). To appreciate the significance of a geological triple point, we must first understand the concept of a geologic contact. Simply put the world is composed of rocks, with many flavors of igneous, sedimentary, and metamorphic rocks: the boundary between different rock types is a geologic contact. Stratigraphic – a contact between sedimentary layers in which there has been continuous deposition. Igneous – a contact between an igneous rock and the rock into (or onto) which it intrudes or extrudes. Tectonic – a contact in which the rocks have been juxtaposed together along faults or shear zones. Erosional – a contact in which older rocks were eroded prior to the formation of the younger rocks, the contact is an unconformity. 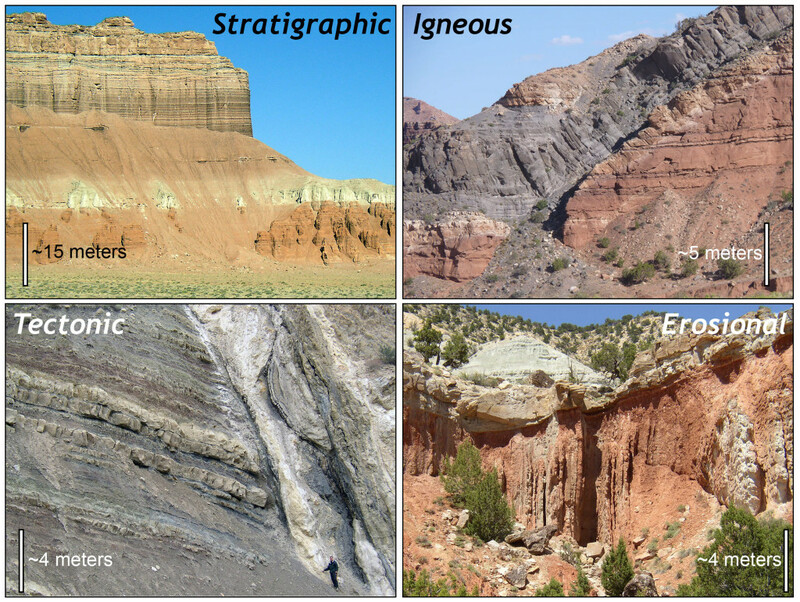 Types of geologic contacts: Stratigraphic contacts from Goblin Valley, Utah. Igneous contacts from Capitol Reef National Park, Utah. Tectonic contact from Cedar Canyon, Utah. Erosional contact from near Salina, Utah. Click on the image for a bigger view. Learning to recognize different geologic contacts in the field is a basic, but challenging, skill. On a map, a geologic contact appears as a line, but it is important to realize that geologic contacts are three-dimensional surfaces. South of Qantab, three geologic units are in contact at one location and form a geological triple point. Geological triple points are significant because much can be inferred about the geologic history of a region at these special locations. The geologic units at this triple point include: 1) Triassic carbonate rocks, these sedimentary rocks were deposited in a shallow tropical sea ~230 million years ago – today, they underlie a precipitous ridge with the strata tilted between 40˚ and 50˚ towards the north, 2) Cretaceous ophiolite, these dense ultramafic rocks were once part of the Earth’s mantle, they were later emplaced onto the Arabian continental margin – today these rocks underlie steep and craggy brown hills, 3) Paleogene sedimentary rocks that includes a sequence of tawny-colored conglomerate, sandstone, and limestone, these rocks were deposited between 55 to 35 million years ago and underlie broad hills and rounded valleys. Let’s first examine the contact between the ophiolite and the Paleogene sedimentary rocks, it’s well-exposed in a road cut south of Qantab. Notice the ophiolite is exposed below the overlying sedimentary rocks. Just above contact there are clasts of the underlying ophiolite in the conglomerate, indicating that the contact between the ophiolite and the sedimentary rocks is erosional. Unconformable contact between the Cretaceous ophiolite and overlying Paleogene strata exposed in roadcut to the south of Qantab. The Paleogene conglomerates contain clasts of the ophiolite. Let’s frame up the geologic history at this spot – the ophiolite formed, was emplaced and uplifted, later it was eroded and exposed only to be buried by layers of coarse gravel and sand during the Paleogene. In recent times, erosion has sculpted the landscape and the ophiolite is exposed once again. The unconformity between the ophiolite and overlying strata continues to the south until it is truncated at the contact with the Triassic carbonates – so the unconformity must be the older of the two contacts. But what type of contact separates the Triassic rocks from the other units? At places this contact involves ophiolite sitting atop the Triassic strata, and at other places it is the Paleogene strata atop the Triassic strata—it’s one continuous contact. Both the igneous layering in the ophiolite and bedding in the Paleogene strata are truncated at this contact. These observations are consistent with a tectonic (fault) contact. Cross section of the geological triple point near Qantab, Oman based on surface observations. The Qantab area, and Oman in general, are exceptional places to see and study geology. No doubt we’ll return to this spot on next year’s Rock Music Oman study abroad program. I’m going to end with a few questions, and I look forward to some juicy discussion regarding these questions. What type of fault is exposed near Qantab? 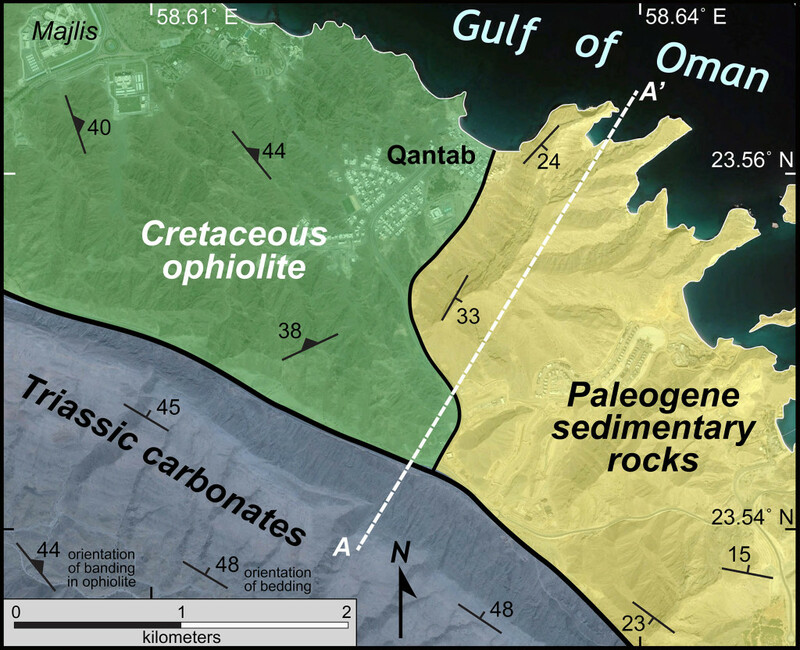 When did faulting occur in the Qantab area? On the geologic map the Paleogene strata dip between 15˚ and 33˚, why do they appear to dip less steeply on the cross section? During a recent lab mapping exercise in my 2017 Earth Structure & Dynamics course, many students drew geological quadruple points! Should geological quadruple points be common? What’s the 3D geometry of a geological quadruple point? How might a geological quadruple point form? What a great read! This really makes me excited for the prospect of Rock Music Oman ’18! In regards to some of the questions, the fault exposed at Qantab is a normal fault: the Ophiolite and Paleogene Rocks comprise a hanging wall that moved down, or the Triassic Carbonates that make the foot wall moved up in a fashion indicative or normal faulting. The dip that we see in the Paleogene Sedimentary rocks in the cross sectional is an apparent dip, that is it is not measured perpendicular to the strike of the rocks. Apparent dip angles are always less that the true dip angle. How did you find the exact location of the triple point? At the triple point, is there a spot that has three distinct types of rocks? Looked like a great trip- I hope you enjoyed the feet eating fish. It seems the triple point shows a normal fault, where the hanging wall with paleogene and cretaceous units is moving down relative to the footwall. It is hard to know when this faulting occurred but it cross-cuts even the Paleogene sedimentary rocks – implying it was active after the deposition of this sedimentary unit. Perhaps it’s still faulting – groovy. Geologic quadruple points should not be common. The intersection of a quadruple point would be a singular point in space. The likelihood of finding a quadruple point is similar to that of finding a unicorn on the Sunken gardens at William and Mary. This is unlike a geologic triple point where the intersection would be a line in space. This is found at many locations around the world. 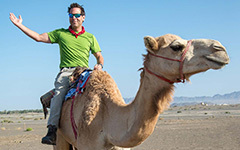 Nice post, Oman looks like an awesome place to look at rocks and/or lay on the beach! Looks like the normal fault at the triple point faulted at some point over the last 55 or so million years, sometime after the paleogene sedimentary rocks were deposited. I’m guessing it was a while after that when the faulting occurred, since it looks like the paleogene sedimentary rocks and ophiolite underwent some kind of deformation prior to faulting(because they are tilted up to 30 deg), but it’s hard to say when. I’m curious about what kind of stresses/what events caused the deformation experienced by the Triassic carbonates, then later the tilting of the ophiolite and paleogene sedimentary unit and the faulting. Any ideas about that? It looks like we have a normal fault exposed near Qantab because older Triassic rocks are in contact with younger Cretaceous rocks, suggesting the Cretaceous rocks on the hanging wall moved downward relative to the Triassic rocks of the footwall. Depending on when the Paleogene rocks were deposited, it’s possible faulting occurred within the Paleogene; the only guarantee is that faulting occurred after deposition of the Paleogene rocks. Lastly, the apparent dip is the reason for the skewed dip in cross section. Also, your green scarf from Oman is pretty dope. I think you should work it into your regular fashion routine. The fault exposed near Qantab appears to be a Normal fault, where the hanging wall (consisting of the Cretaceous ophiolite and Paleogene sedimentary rocks) moved down relative to the foot wall (Triassic Carbonates). You can tell that the hanging wall moved down, by understanding the geologic time scale, where Paleogene and Cretaceous rocks are younger than Triassic rocks. In order for these rocks to be in contact with each other, the younger rocks had to move down relative to the older rock. The Paleogene strata appear to dip less steeply on the cross section because of apparent dip. True dip is measured perpendicular to strike, however a vertical cross section is not necessarily perpendicular to the strike. The apparent dip (which is less than true dip) is influenced by the true dip AND the angle of the vertical cross section relative to the strike. The fault exposed near Qantab looks like a normal fault where the footwall of Triassic carbonates moved up while the hanging wall of Cretaceous ophiolite and Paleogene sedimentary rocks moved down because the older Triassic rocks became exposed and the contact between Triassic carbonates and Cretaceous ophiolite and Paleogene sedimentary rocks truncates the contact between Cretaceous ophiolite and Paleogene sedimentary rocks, indicating the contact with the Triassic carbonate is younger than the other contact. So the faulting would occur after the Paleogene sedimentary rocks were deposited. The Paleogene strata dip less steeply on the cross section than on the geologic map because they are shown in a skewed view in the cross section, resulting in an apparent dip, which is smaller than the true dip that is measured perpendicular to the strike. The fault that at Qantab appears to be a normal fault. The hanging wall (Cretaceous ophiolite) moved down while the footwall (Triassic carbonates) moved up. In reference to quadruple points, they are the unicorns of geology: they just don’t exist. Very informative. Were there other geologic units present in the region? Or were you limited in your findings to what we can see here? Anyway, the cross section shows a great example of both a geologic triple point and a tectonic contact. Much has already been said as it relates to the questions posed, and I am inclined to agree with the answers above. The Qantab fault seems to be most likely a normal fault due to the spatial/age relationships of the rocks, noting that the younger rock (Cretaceous ophiolite and Paleogene sed rocks) are in the hanging wall, and have moved down in order to be in contact with the older Triassic rocks in the footwall (indicating a normal fault). As it relates to the other questions, I won’t reiterate the responses for length as well as a bit of lack of understanding, but it was helpful to read the other responses in order to enhance my understanding! This looks like a normal fault because you can see that the fault separates Triassic and Cretaceous materials, which means the Cretaceous Ophiolite (along with the Paleogene sediment) moved down in relation to the Triassic carbonates. This means faulting occurred sometime after the deposition of the youngest material. These angles on the geologic map are apparent dip angles, which appear less steep on a cross section. We can’t say unicorns aren’t real though, you just never know! I’m holding out hope. However, quadruple points are probs not plausible. Not a whole lot extra I can add, but I do certainly agree with the proposition that the triple point is a normal fault. I’m also a fan of Jake’s outlook on geologic quadruple points, and would love to know if any of them actually exist. Also YES, the disparity between the geologic map and the cross section dip is due to apparent dip, something I unfortunately have been guilty of. Not proud of myself. Curious of two things however: what kind of rocks underlie ALL of the aforementioned units, and were you guys alone on the beach? Just seemed like really nice weather, would hate to see it go to waste. Certainly beats the winter resurgence that’s occurring in Williamsburg. Quadruple points could potentially form in areas that have experienced multiple episodes of faulting. -It appears that there is a normal fault here, allowing the younger Cretaceous rocks to slip down next to the Triassic rocks. The faulting must have occurred at some point after the Cretaceous, but before the deposition of the Paleogene rocks. -Triple points require the three types of rocks to meet at the same X, Y, and Z coordinates. The odds of three units meeting like this are rare enough, for four to do so would be almost impossible. I am going to have to agree with the conclusion that the fault is normal in nature, as you have the older Triassic layer moving up relative to the younger Cretaceous and Paleogene layers. The faulting must have occurred sometime after the deposition of the Paleogene sedimentary rocks, because that layer is truncated by the Triassic rock. The dipping in the cross section is the rather unfortunate product of some gnarly apparent dipping. Geologic quadruple points are similar to leprechauns, or disposable income in a college student’s bank account, they simply do not exist. How would one form? Maybe some clever use of dynamite and heavy machinery, but other than that I don’t believe that nature possesses the kind of precision to have 4 geologic units all touch at one specific point in space. It would appear that some faulting of the normal variety has occurred in this region of Oman, at some point after the deposition of the Paleocene strata that are now truncated by said fault. The dipping variability between the map view and the cross section are likely due to a healthy dose of apparent dip. As for quadruple points, I wouldn’t hold my breath trying to find one. It’d be interesting to see if they do exist, but I suppose triple points will have to do. Very exciting stuff Chuck, if you guys discovered a geologic triple point in one town in Oman it’s pretty exciting to think what else might be waiting to be discovered in the next town over. The reason that the Paleogene strata don’t seem to be dipping 15˚ and 33˚ is because the cross section is not perpendicular to the strike of the unit. Only when the cross section is perpendicular to the strike plane and in the same plane as the dip would the cross section reflect the true dip of the rocks. If it is at all oblique to the strike, is is the apparent dip that is shown in the cross section. It is very important that when measuring the strike and dip of units on a clear-cut face (e.g. a road cut), you have a sense for which direction the beds are dipping. This will help avoid measuring the apparent dip…. a friend of nobody. 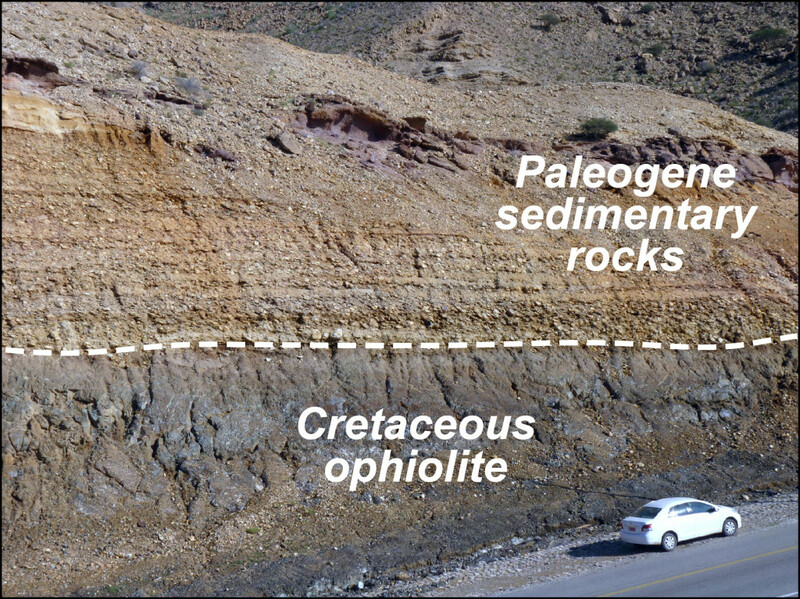 The fault exposed near Qantab is a normal fault, as the Triassic carbonates, the footwall, moved up relative to the Cretaceous ophiolites, the hanging wall. It’s hard to say when exactly rifting occurred, but sometime after the deposition of the Paleogene sedimentary rocks. Maybe we can better constrain this date by understanding the tilting of the sed rocks or clues from other units. I agree with the consensus that this is a normal fault with the younger, Cretaceous ophiolites forming the hanging wall that moved down relative to the older, Triassic carbonates composing the footwall. It’s likely the faulting occurred after the the paleocene sed rocks were deposited 43-66 million years ago (although there is no evidence in the cross section that faulting has ceased). I would also like to know how the ophiolites were emplaced in this sequence, as well as when uplifting occurred. Could it be possible to date the exposure using cosmogenic radionuclides? A quadruple point would be exceedingly uncommon, perhaps never occurring naturally at all. Geologic triple points on the other hand might not be as rare as Chuck implied – after all, there are two in the state of Ohio alone! What’s up with that? Oman? More like Oh Man, geology is so cool! I agree with the previous posts regarding the normal faulting occurring in Qantab and the apparent dip resulting in a less steep dip in the Qantab cross section. Although I would not go as far as to say that geologic quadruple points are impossible (is anything truly impossible? ), they are likely extremely rare and a result of very specific faulting conditions if they do exist. The fault exposed near Qantab is a normal fault, which occurred no more than 35 Ma. The dip on the cross section appears to be less than the actual dip due to the fact that the view we have is at some angle that is not perfectly aligned with the strike of the rock, and so we are viewing an apparent dip. Would a quadruple point occur at a place like the San Andres fault, where a slipping fault could move a contact until it lines up on the other side with two different units in contact? Is there a way it could occur in a static area?